Virtual Tree is not your typical China Digital Marketing Agency, our mission is to help you grow your business, not just spend your money. When you think about marketing in China, the first two platforms that come to mind are WeChat and Weibo, but if you're only focusing on these platforms, you're missing out on a huge part of the market. Not to mention, if you're an overseas business that wants to get started on WeChat, it is very expensive - you need to be prepared to spend at least RMB200,000 (approximately US$29,000.00) in ad spend alone just to start, and this is before you add on agency fees and creative fees. That makes it out of reach for many businesses unless you're a big brand with deep pockets. 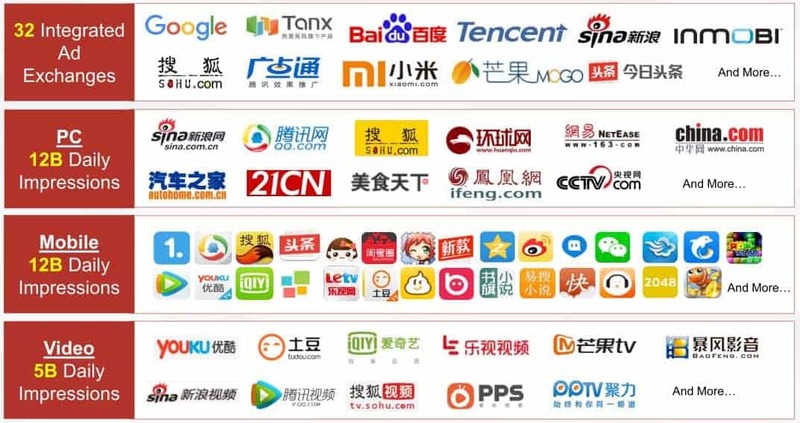 Virtual Tree has partnered with one of the biggest Demand Side Platforms (DSP) for the China ad space, iPinYou, to bring it to small to medium businesses. Focus on key performance indicators (kpi's) that matter to you and your business. Exclusivity: we're very protective of our clients, as long as you are a retained client, we do not sign any other client that is a direct competitor of yours so you have peace of mind, we're not helping your competitors. You have our full attention: we only take on a limited number of clients and never over-stretch ourselves so you get the attention you deserve. No long-term contracts: the China marketing management service is offered on a campaign-based or monthly service, so you have no long-term contract - you may cancel the service before your next billing date. We don't say "YES" to everything - ever deal with freelancers/agencies that seem to promise the world and say yes to everything and the results fall short of what you expect? We don't do that. We do our best to manage expectations and not promise things we can't deliver on. Over 20 years of marketing experience, our founder has over two decades of marketing experience and shares input in your campaigns. We learn and continue to learn from some of the best marketing experts in the world: we believe in keeping ourselves sharp, so we've taken courses from some of the best in the industry and keep learning the latest strategies. Select the appropriate plan you want. Apply by filling out the booking form. We'll schedule a call with you to learn more about your business and your goals and to see if we're a good fit to work together. We'll evaluate whether your business products/services are suitable for the China marketing service. If we're a fit, we'll request a deposit to get things started. We'll work with you on the audience targeting and the ad creatives & messaging. This is best for businesses with proven sales from China market and want to scale up further.